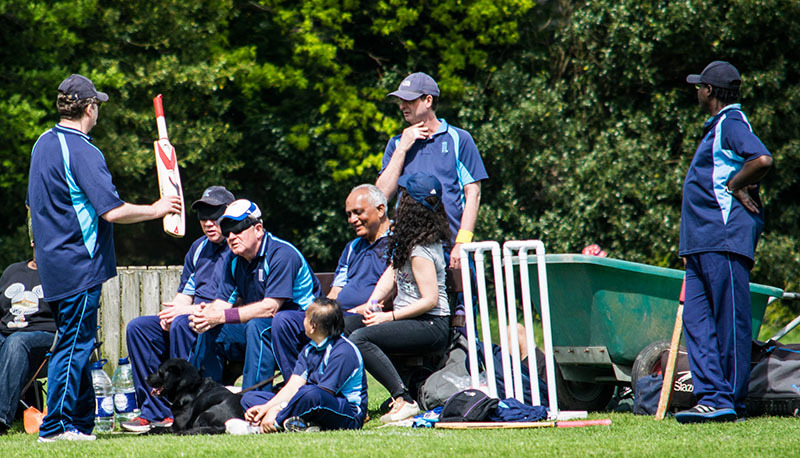 Yes, all good things have to come to an end and on Saturday the Metro Devils long unbeaten T20 match run was ended by the Gloucestershire Growlers in an exciting game at Highgate. This was a first as the Devils had won every game they played in the South & East T20 trophy since its inception in the 2014 season.On a day with warm sunshine making for a pleasant cricket playing day in stark contrast to the conditions endured by the Devils at Hampshire the week before, did it all go wrong from the start? The coin when tossed rolled along the ground for several seconds before dropping with its tail down after the call had been heads. The visitors put the Devils in to bat and wasted no time in taking an early initiative as Elyse bowled Brenda with the first ball of the day.This start was backed up by good bowling from the visitors that contained the score well as David Burt joined Gary in the middle, so that at drinks after 10 overs the score had only reached 80. 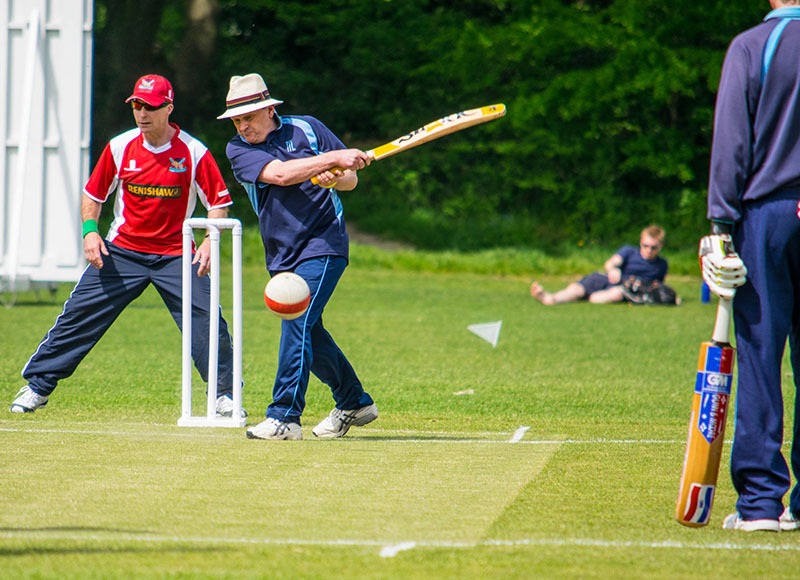 The visitor’s total, Mike, took a second wicket with the penultimate ball of the next over as David hit wicket bringing the home captain to the crease. This resulted in a period when the Devil’s scoring rate accelerated – as Dave S raced to 23, including 5 fours, off his first seven balls while Gary hit 10 from four balls to reach 51, when he had to retire with 109 on the board in the thirteenth over. Chris Lewis and the skipper kept the run rate at around 10 an over for most of their partnership of 69 but then the Growlers dragged the rate back with good bowling at the death from Bob, Elyse and Darren, who completed the seventeenth over after Elyse injured a finger attempting a tricky caught and bowled. Would he have bowled if that had not happened – who knows, but he delivered a fine nineteenth bowling Chris and conceding just 8 runs. Everton hit two fours in the final over so there was a flourish to the end of the innings but the visitors were pleased to have the score at 6 under the 200. After tea their innings began at a very fast pace in contrast to the measured Devils start; 50 was on the board inside five overs with the visiting skipper John scoring his 51, with 7 fours, from just 27 balls in a 75 run opening partnership. The Devils bowling only finding success on “free hit” balls – in a league game they would otherwise have picked up two wickets, and the roar of apparent success on the first occasion took a while to dispel as not all the players seemed aware of this T20 rule. Following John’s retirement the scoring rate was slowed by the Devils, but still at half way the “worm” was 24 ahead and the game seemed to be heading for an early end. When the visitor’s other opener Ed retired after reaching the third 51 of the game the score was 162 from 15 overs – but there was to be a twist. In the next over Chris Lewis completed a run out after fielding off his own bowling and then trapped Marc leg before. 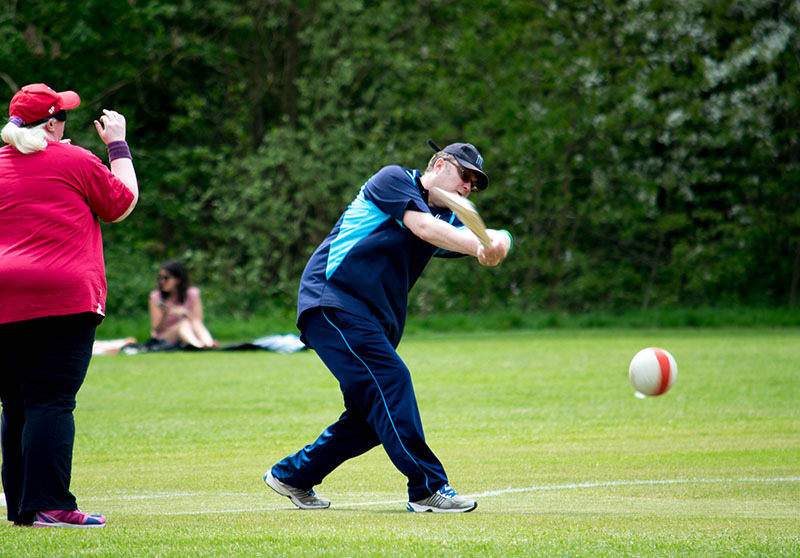 Alan restricted the visitors to 7 from the next over as they started trying to run for anything, before a dramatic eighteenth over saw Dave S take two clean bowled wickets while Brenda completed a run out – from a “free hit” delivery. So there were 9 runs to defend from the final two overs and tensions were running high. The striker’s runner was trying to sneak a start before the ball reached the batsman and at one point after a leg bye had been taken the batsman on strike was not changed – causing great distress on the scorer’s bench. The desperate running saw three byes, that leg bye and a run taken from a wide to leave the scores level at the start of the last over. Advantage Gloucestershire as only bowling a maiden over could win the game for the Devils, and charming as he is, the captain could not deliver; he was not able to grab a catch as the visitor’s total skied the first ball into the air and a run was completed. Gloucestershire will play Dorset in the T20 semi-final. This leaves just the league for the Devils to concentrate on this year – with a visit from Kent Spitfires next up, in a fortnight, on the BCEW birthday weekend. Metro will play their opening game of the season the next day at Northants. On a pleasant summer’s day the Whitecliff Recreation Ground overlooking Poole Harbour must be a lovely place for a game of cricket. Unfortunately, the Devils arrived in the teeth of a gale blowing off the sea and even the locals were dubious about the sense of proceeding. But, as we know, the Devils are made of stern stuff and pressed on regardless. Having won the toss the Devils made the easy decision to ask the Dolphins to bat first. The wind was so strong that after just 2 balls it was agreed to dispense with changing ends and to bowl all the overs from the sea end. And it became clear that the fielders all needed to be behind the bat. The occasional attempt to drive just resulted in the ball looping up in the air and landing behind the batsman. However, the wind-assisted pace of the Devil’s attack was presenting an opportunity to the batsmen. A nudge outside off stump resulted in the ball racing towards the boundary with fielders posted on the rope acting like goalkeepers trying to prevent it crossing the line. But the bowlers managed to keep the extras down and the fielders did their job of limiting boundaries. With a break for rain after 7 overs the match was reduced to 20 overs a side – another advantage to the Devils as the Dolphins had only just reached 50. Despite a lack of wickets the Devils stuck to their task. 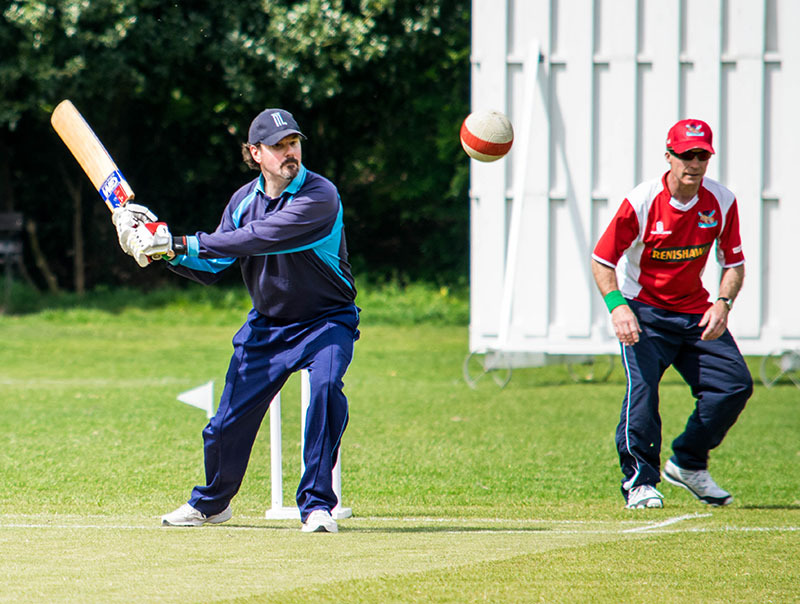 The Dolphins’ opener, Tom Mackenzie made a fine 50 before retiring but they were unable to improve the run-rate and ended on 140/1 after their 20 overs. Despite losing opener Chris Lewis in the first over the Devils made good progress in reply, keeping up with the required 7 runs per over. After 10 overs they were 75 for 3, having lost David Burt and Brenda Cassell. This brought Aemonn Shearing and yours truly together and we managed to progress the innings with minimal drama. The Dolphins’ bowling was slower than the Devils’ had been, meaning boundaries were harder to come by but there were plenty of singles to be had. I retired in the 18th over allowing Gary Moritz to come in to hit the winning runs and leaving Aemonn on 39 not out but exhausted. Chris’ attempt to order fish & chips for the journey home faltered as he checked the closing times for the shop by the station. His iPhone read out the times from the website in a long slow delivery as the Devil’s expectations grew… Monday…8pm… Tuesday…8pm… mouth’s watering in anticipation of fish fresh from the sea… Friday…8pm… Saturday…8pm… and chips dowsed in vinegar… Sunday… they could almost taste them… Closed.